Are the eyes of giant squid unusually large? Direct observations of giant squid are very rare (and thus the footage released earlier in 2013 is so extremely interesting). An intriguing possibility to find out more about giant squid other than direct observation is optical modelling. Estimates of their visual capacities may tell us something about their foraging and predator escapes techniques. This approach was pioneered and further developed over many years by Dan-Eric Nilsson, Eric Warrant, and Sönke Johnsen, and along with co-authors Roger Hanlon and Nadav Shashar they found some indication that the detection of sperm whales (a giant squid predator) is the mechanism driving the evolution of very large eyes in giant squid. Certainly a very intriguing hypothesis. Here’s where our work comes in. Are the eyes of giant squid really unusually large? Is it possible that the large eyes of giant squid are simply a result of the large body size? We analyzed this by collecting measurements of body size and body mass in a large number of different squid species and compared the relative eye sizes across our samples. The difficulty is that giant squid are by far the largest squid, which makes the comparison challenging (but not impossible). Our results suggest that giant and colossal squid do not have unusually large eyes — their eyes are as large as expected for their body size, no matter if the analysis is carried out with standardized major axis (the preferred method) or ordinary least square regression (known to underestimate the slope). The figure below shows the SMA line; giant squid individuals are in yellow, colossal squid individuals are in red. Please note that neither giant nor colossal squid were included in the calculation of the SMA lines. 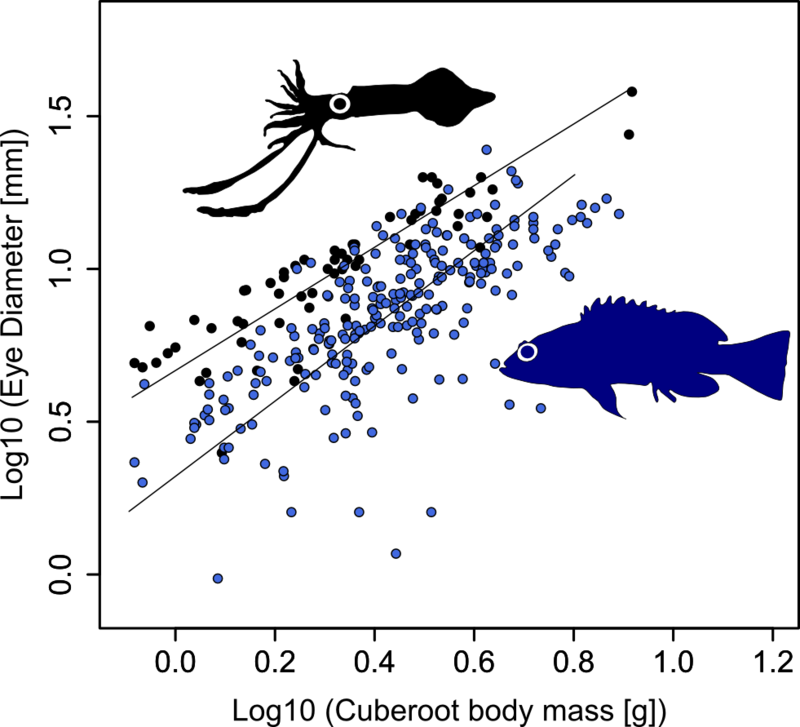 We also investigated how the eye size of squid compares to other marine organisms, for example acanthomorph fish. As the eyes of giant squid are so much bigger in absolute terms than the eyes of swordfish with similar body size (~27 to ~9 cm), one wonders if it is possible that all squid have bigger eyes than fish when body size is accounted for? Our results show that many squid indeed have bigger eyes than fish for given body size. 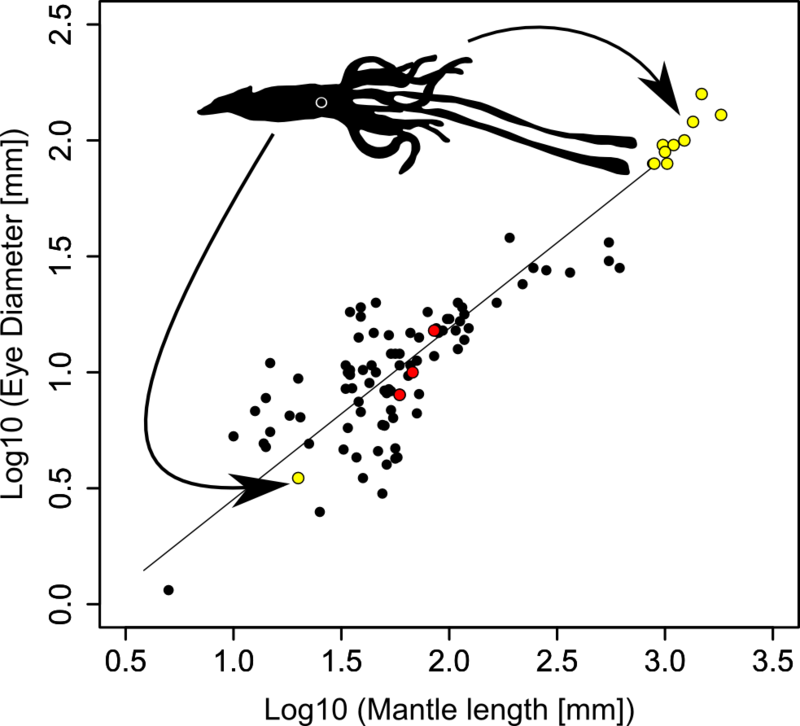 However, there is some indication that the differences become smaller with an increase in body size (see figure below; the line is the SMA line). We think that by compiling these large comparative data sets we can improve the understanding of eye size evolution in squid. What’s next? Well, as usual, we need more data. In particular on additional species of squid, but also on other individuals of giant squid, especially the big ones. Also, the current understanding of squid phylogenetics is not sufficient yet to account for phylogenetic covariance among species, even though very important steps have been taken by Lindgren et al. We hope that a time-calibrated phylogeny will become available soon. Also, what is the function of big eyes in the deep sea? We discuss this in depth in the paper, but I would like to give a brief summary. Nilsson et al. found support for a unique advantage of big eyes in the deep-sea: the detection of large luminous objects, for example sperm whale, a predator of giant squid, seems to have the longest visual range. Nilsson et al. carried out a sensitivity analysis of the optical model, which indicated that the results were robust when varying one single parameter at a time. However, we found that as soon as you start varying multiple variables, the model essentially collapses. We compiled additional published data relevant for model parameters, and with conservative estimates we found that several optical functions perform equally well (e.g., detection of point light sources as well as large luminous objects). Is it possible that there may not be a unique advantage for having big eyes in the deep sea, after all? Let’s not forget that our knowledge of the deep sea is very patchy, plus, there will be spatial and temporal differences, as well. It will be important to collect additional data in order to fine-tune the model. 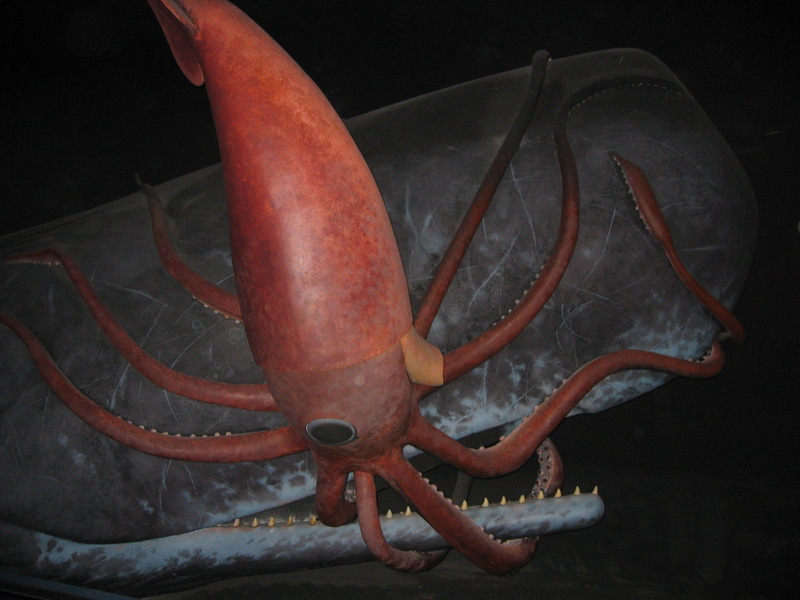 This entry was posted in own research, vision and tagged colossal squid, deep sea, evolution, eye evolution, eye size, eyes, giant squid, optical model, sperm whale, vision. Bookmark the permalink.